Suddenly, in one terrible instant an unimaginable tragedy strikes and the boy’s happy life is overturned, sending him into exile and on an odyssey of lurking dangers, dashed hopes and thwarted ambitions. Torn from his family and uprooted from his homeland, the young boy is dispatched to a seminary in Jerusalem where he is renamed Jonah and embarks on a discovery of his true heritage and new identity. This sanctuary is also snatched away when Jonah, still in his early adolescence, finds himself caught in the crossfire of the Holy City’s “unholy” wars. 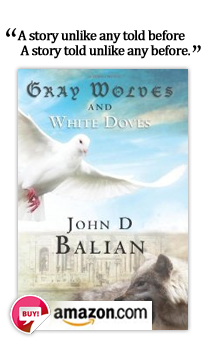 Based on actual events of the 1960’s and 1970’s in the Middle East, Gray Wolves and White Doves transports the reader to a land steeped in ancient rituals, Middle Eastern traditions and modern intrigue. From this tumultuous background rises a moving, captivating story of a child’s search for identity and belonging amid rekindled feuds and the turmoil of a changing world. As poignant today as ever, Gray Wolves and White Doves is a real life, action-packed thriller that weaves a timeless tale of man’s perseverance, the endurance of hope, and the winning ways of the human spirit no matter how bleak the circumstances.